I'm sure the styling of the new McLaren Speedtail won't be to everyone's tastes, but having seen it up close, I can assure you it has a presence that can't fail to impress. It’s huge, for one thing, stretching more than five metres; in fact, it's longer than the BMW X7. The long, sweeping eponymous Speedtail gives it a hint of mid-1970s Le Mans sportscars, mixed with the hyper-slippery lines of an ultra-efficient speed record machine (and, to my eyes, a hint of Jaguar XJ220). If you’re lucky enough to see one of the 106 examples that will be built on the road, you’ll notice it. To achieve its lofty top speed, the car needed to produce minimal drag. To do that, McLaren’s design team dabbled in the art of marginal gains – a nip here and tuck there, following the approach of British Cycling. You notice that approach with details such as the fixed front wheel covers and the flexing carbonfibre ailerons at the rear of the car. But you also notice it with the way the Speedtail’s bodywork curves and bends. By applying that logic to minimising drag, the Speedtail looks very different from the McLaren Senna, which, like a racing car, was designed for maximum downforce. And it also suit the car’s positioning as an ‘ultra-GT’ car. The end result is a cutting-edge, futuristic car that looks different from almost everything on the market. And that’s why the Speedtail can have an impact that stretches beyond the 106 people who have bought one. Melville calls is a “dream project”, as you might expect from someone who admits to having a poster of a McLaren F1 on his bedroom wall. 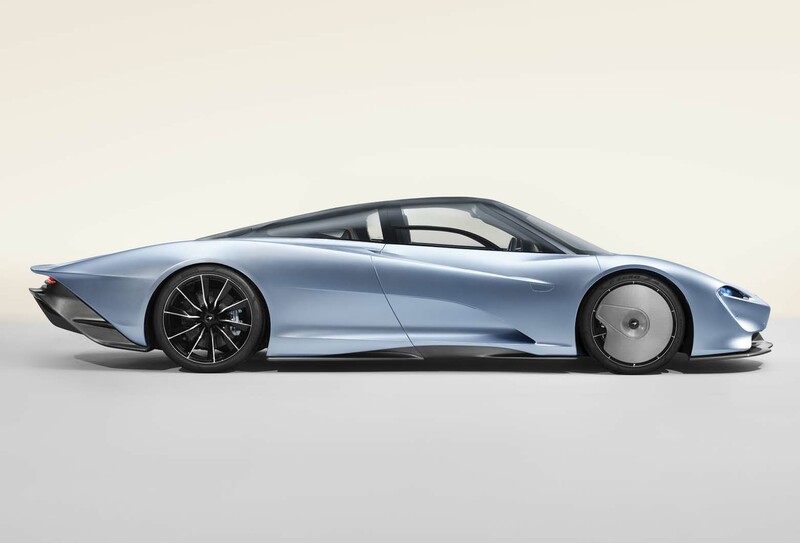 It’s no wonder, then, that he says the Speedtail is “the sort of car I hope will go on a poster on a kid’s wall”. I hope he’s right. It’s often said that today’s youth don’t care about cars, but it’s bold, crazy projects like this – with futuristic styling and incredible stats – that can hook them in, as cars like the XJ220 did when I was growing up. With the Bloodhound land speed record project struggling, we need bold, aspirational dream cars. That Speedtail delivers on that score. Another 300bhp and the most ridiculous set of wheels ever seen just to go 7 mph faster than an F1? I like the fact that McLaren have defied convention with the wheels and other details. Let others follow the pack. Fixed carbon fibre aerofoils for the front wheels are next level cool, it’s almost better if the haters queue up to criticise. For the 106 lucky owners, the ‘controversy’ only makes their car more famous. Just put the silly wheel covers on the back wheels too. Silly looking (Or very XJ220 like) and it would not look so streamlined. As it stands right now, it just looks like the rear wheel trims fell off. The front wheel covers are far more important to the aero than the rear wheel covers. They're optional anyway, so you don't have to have them at all (and you can probably get a pair for the rear wheels if you'd like; just add money). If they had just taken the F1 design, made it lighter with a modern carbon fibre core, added in a more modern engine (Senna level of power) and smartened up a few other things to take account of technology improvements, it would be faster than the F1 but much more beautiful than this monstrosity. Bragging right or Pub talk...? Top speeds are irrelevant, well, are they?, we are lucky if we see one of these Hypercars and generally they’re doing the same speed as us because the Road / Traffic conditions dictate this. ..It's no mistake that they even have similar rims with a touch of subaru legacy SVX around the windows. The design looks like a styling failure to me. It's hideous...and ridiculously big. Thought the key to speed and agility was lightweight and smallness.